The Goa Tourism Development Corporation or the GTDC is not unlike their other boring counterparts across the country. They are hip and happening, and are adding another feather in their cap by launching the new G.T.D.C App for Apple and Android phones. The GTDC is the first in the country to have an app in India. 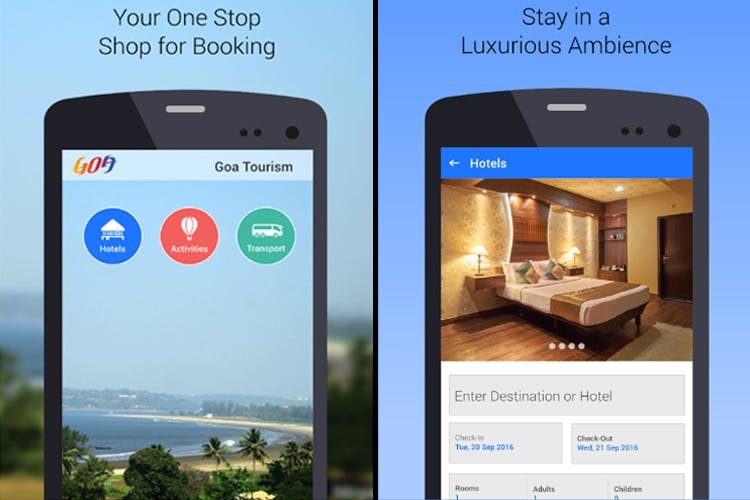 So download the app, and start planning that Goa vacation. Currently split in three sections, the app has hotels, activities and transport as categories in each section. The first category which is hotels, covers not only hotels across every price range, but homestays, bed and breakfast places as well as boutique resorts. So punch in your dates and other requirements, and it will show you a host of stay options in every budget. Unlike earlier when they only listed the GTDC owned or managed properties, now there are loads of private properties listed too. The second section is called activities and is an exhaustive list of all that you can do in Goa. So be it booking a temple visit for your parents while you go white water rafting, there are many sections for all the activities you can do in Goa. The best part, you can book all of them from the app, after browsing through all the details of each activity. From the prices, to the location and duration of the activity, the app tells you all. And then there is transport, with what we thought was the best feature of this app. They have integrated a cab call option in the app, so once you click on it then it straight takes you to their central booking number on your phone menu. So no more googling taxi guys numbers in Goa or asking around for numbers. If you’re wondering if the taxi guy is overcharging you or is reliable, just book one through GTDC. Start packing those bags and thinking about those Mai Tais on the beach.